Can designers learn from the emerging field of complexity science? I joined a workshop held at Saïd Business School which was one of the satellite events at the European Conference on Complex Systems (ECCS '06). The workshop was part of a wider series, organized as a cluster called Embracing Complexity in Art and Design funded through the first round of the cross-disciplinary Designing for the 21st Century initiative. Of particular value I found the presentation by Lauri Koskela of Salford University. He talked about the differences between ancient Greek terms such as analysis and synthesis and their current meanings, and the confusing attempts of competing contemporary design disciplines and "design science" to articulate theories about design. The ideas explored in Aristotle and Pappus, for example, constitute a proto-theory of design, he argued. Alec Robertson from De Montfort University described the More is More symposium held at the end of 2005 which brought together a range of perspectives. In design, he pointed out, it is considered a truism that 'less is more' but George Rzevski's workshop (at a previous event organised by the cluster) 'Complexity is Beautiful' was the starting point of an idea that challenges this: more is more. Jeff Johnson (Open University) and Eve Mitleton-Kelly (LSE) described interdisciplinary projects they are setting up that bring together social scientists and scientists working with complexity, with design and art practitioners. Like design, complexity is far from being a single discipline but it seems likely that cross-disciplinary discussions may lead to a valuable exchange. My questions would be: how do design practices respond to complex (or complicated) problems? To what extent do traditional or modern methods and skills cope with the challenges of designing complex products, services and environments? The emerging discipline of service design is becoming strikingly visible on the national agenda ... and is increasingly articulated by designers educated within art & design traditions rather than management or service delivery operations. Last week I attended a public event hosted by RED, a unit of the UK Design Council where three members of their interdisciplinary team of six presented what they do, and how and why they do it. The talk was part of a drop-in open day with a mini exhibition in the room next door. RED is led by Hilary Cottam (who won the Design Museum's Designer of the Year award last year). Its associates include the former head of IDEO's London office, Colin Burns, as well as Charlie Leadbeater, who also teaches social entrepreneurship at Said Business School. RED is making an argument about the role of design in public services. Its focus is on helping create "a new generation of public services, designed around individuals" that are co-created with them, and that are preventative. Some of these ideas were made public in Feburary when RED published its paper on Transformation Design. Meanwhile over the summer, the influential UK think tank Demos published its paper on similar themes, entitled The Journey to the Interface co-written by Joe Heapy of service designer consultancy Engine, which makes an argument about how public service design can "connect users with reform". It seems as if a vocabulary and set of practices loosely assembled in fields such as experience design and human computer interaction design, enacted in both informal, commercial and academic domains, may now be taken up in public service contexts. At the RED event, members of the team described their processes and methods and what they want to achieve. Jenny (no surname given) talked about RED's ambition to design for behaviour change: "As designers what we are doing is less about shaping form than shaping behaviour," she said. She went on to acknowledge that this sounded "a bit sinister" but then argued "But actually it's been used for a long time in the private sector." So these practices have the potential to (re)design not just the services, but the service users too. But the outcomes of public service designs are complex. RED sees value in making use of design methods used in Marks & Spencer, for example, to make the consuming experience "compelling and desirable" and applying them to public service contexts. In the M&S context, the use of these methods may well have a clear, measurable business objective: increasing sales, for example - and even here design practitioners may well struggle with framing the design problem, communicating with the client, and measuring the value of the design process and artefacts. How much harder it is to define and agree goals for public services or public goods. To what extent can design-led techniques make the UK more democratic? More healthy? More intelligent? With my colleague Steve New, I presented a paper at the EUROMA (European Operations Management) conference held in June in Strathclyde. With the title "On the Anonymity and Invisibility of Process Design"we argued that within the field of Operations Management (OM), the task of process design has suffered neglect in the development of Operations Management. Although there is extensive literature on product design and to a lesser extent the design of services, the designing of processes is neglected. We examined how process design remains an essentially invisible and anonymous activity and then presented a three-point manifesto for change. First, we argued that, rather than imagining a target audience of generic Operations Managers, the field of OM should focus on the education and research needs of a newly-founded profession of Process Designers. Secondly we argued that OM needs to understand how to design, not just follow, design processes, and the difference between user involvement and ‘implementation’. Thirdly we argued that great Process Designers should be famous, like architects or product designers. To illustrate our ideas we brought along some imagined artefacts from this world in which Process Design is a visible and recognised discipline (will be uploaded soon). These included a private view invitation to the opening of a fictional call centre; a screen grab from the Saïd Business School's website with details of a fictional MA/MBA in Process Design, taught jointly with the Royal College of Art; front covers of imaginary magazines for professional process designers; fictional TV listings showing reality TV and documentary programmes engaging with Process Design issues; and finally, a fictional award for Process Designer of the Year - the Voss Award (named - with kind permission - after Professor Chris Voss of London Business School for his years of involvement in OM and research into experience and service design). 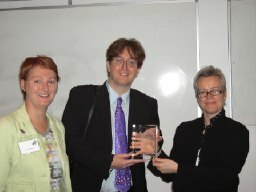 During the presentation we asked the audience to nominate potential winners for the award and we presented, on this occasion, the Voss Award 2006 to the nominators. This week I was supposed to be part of a group on a fact finding missing to San Francisco, Chicago and Boston, initiated by the UK Design Council and the Higher Education Funding Council for England. Unfortunately owing to recent illness I was unable to join the trip but my Said Business School colleague Marc Ventresca, who teaches and researches in strategy and innovation, was able to go. The aim is to examine models in US education in which design and management teaching and research are integrated in different ways, as part of the process of reflecting on the findings of the UK's Cox Review on Creativity in Business, published late last year. The arranged visits include the Stanford d-school, IDEO, Apple, Chicago's Institute of Design, and on the East Coast, MIT. A report about the trip will be made public by the Design Council. The questions I hoped to consider on the trip included: How is 'design' enacted in different teaching and research institutions? What ways of working across disciplines are used? How current is the term 'design thinking'? What emphasis is there on service design and interaction design? To what extent do these institutions and organizations make claims about leading by design, and design as strategy?